Can someone help me I have installed all of the required mods but for some reason my characters don't look like they should. Here are some screenshots. https://gyazo.com/5cf660b4f798f0caed686b9324b86d05, https://gyazo.com/bf8fd7afee37fca23dec10a7feca57fd. And here is my load order https://gyazo.com/bda8f2dd15c06a43c6abee813e11be86. Any help would be appreciated. I'm receiving the Exact same result! Please Help us. Using FO4 Mod Organizer, all Mods are on the newest Version. used SORT. It does seam like there is something wrong with the face skulpturing. They look completely diferent then they should. Expecially in the Nose area. Edit: Tried NexusModManager instead. Still same result. Reinstalled FO4 completly, put F4SE over clean install, -> Still Broken! I've just installed both preset packs and Red, and experiencing the same thing. CAS hair is the only one not loading properly. I even grabbed the 2nd More Hair and Beards, because it sounded like it had more Female hairs too. No luck. 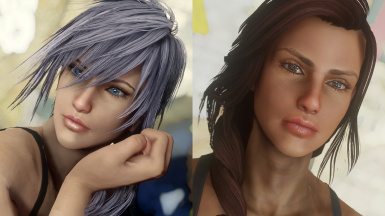 I had to download some extra hair packs I found online to get Lightning's hair to work. I could throw them your way but idk if it's rude to do that on another mod's comment page. Gonna assume it most likely is. Never found CAS' hair, though. Chimecho, Lightning's hair is working for me, thanks though. JackStark, thanks but I've had KS Hair w/ physics installed, sadly it still doesn't give me CAS hair. Still no luck, I had given up looking. I figured if NotWord2 got enough messages about it, might find an error with the upload or something. I don't seem to have any errors but haven't checked it with FO4Edit yet. It might be that Oeliza hasn't updated his KS Hairdos with new hairstyles on the Nexus yet. I'll ask him about it. Oh, thank you! That would be super cool. Does he upload them elsewhere, also? It's something I'd like to know too. He said he will eventually update it during holiday, and no, the ports are only available on Discord so far. As in the Nexus discord server? Is it pretty easy to find on there? Private Discord server. If you are a member, you would have noticed the file, and I am not allowed to invite newcomers. Be patient, eventually you can contact Oeliza via PM here. Still nothing, NotWord2 (or anyone) can you suggest the next closest hairstyle? Edit: NM, I realize now it won't matter because the Preset won't be changed, without the CK. So, it's best just to browse manually at creation or during edit. 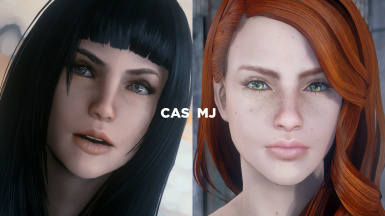 Not the same person, but I'm experiencing wrong hair for Cas (she has default black Nora hair for me instead of the straight hair like in the screenshot), most of my presets also get black lipstick even though they shouldn't. I'm using Vortex Mod Manager and latest version of Script Extender. I have fixed my load order with LOOT as well. 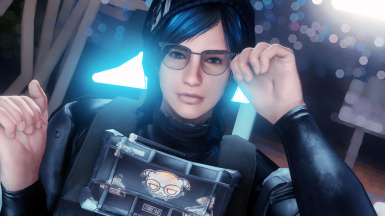 I might be using an updated version of Oeliza's KS Hairdos, which is why you don't have the hairstyle CAS preset uses. 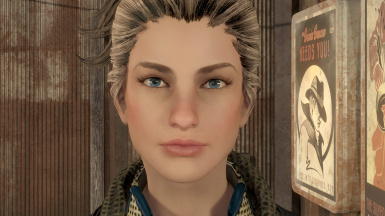 As for the lipstick, it's an issue of Pip-pad mod being active. i found the culprit. it isn't Pip-Pad if you never installed it. Pin-Up Girl Red Lipstick required by some of the preset packs is the one causing the black lips bug. i'll try to look into the plugin and see what's the deal. 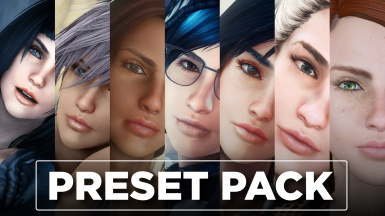 most presets in the preset packs released don't edit the lip's colour (tint layer: "528"), and will default to probably the first lipstick colour. the LMCC version of pinup red lipstick will add one entry (template index: 3946) to the lip tinting group. however, by adding one more entry to the group, it seems like it messes up the colour's order, and somehow the black lipstick is actually the pin-up red lipstick colour but with bad alpha/hue/saturation adjusted by LooksMenu. if one uses the standalone non-LMCC version, loading it before LMCC will be overridden by LMCC, while loading it after LMCC renders every face customisation tints added by LMCC to be useless. Strange, I'm not using the Pin-Up Girl Red Lipstick mod. Mine seems to be the Pip-Pad as NotWord2 mentioned. I've tried to post in that forum about the issue with no luck. Guess I'll try Reddit forum. Vanilla textures maybe? I believe somebody posted a solution to this on one of my preset packs. Look around, it might be here somewhere. Also: does this happen with all of downloaded presets, or just some? Edit: Nevermind, had to reinstall looksmenu, and it finally worked. Probably had it outdated. I can't get the preset option to show up, do I have to restart a new game? Someone help. Uninstall your looksmenu and reinstall it. Move the plugin to the bottom if need be. 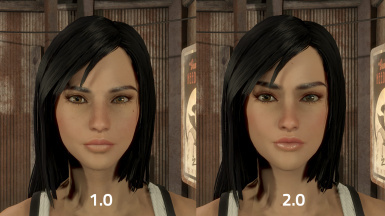 Can't get Tifa V2 to work but the original preset installed fine. Any ideas on how to fix?